Some citizens believe Metro will help, while others continue to protest against the tree felling and the lack of transparency and democracy in Metro decisions. Meanwhile the project document raises many questions. 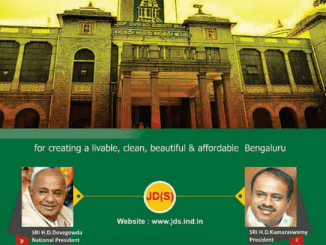 JDS promises to create a Bengaluru Waste Management Authority, wants to limit road widening and solve Bangalore’s traffic problem with underpasses and skywalks. Working on finding solutions to challenges faced by the disabled in rural areas? Apply for the Enable Makeathon by Nov 15 for the opportunity to see your idea through to fruition.